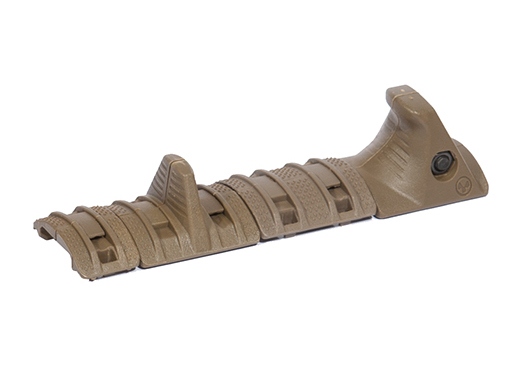 The Tac 9 Industries Hand Stop Kit is an excellent way to add extra grip to any picatinny rail system, making it much easier to grip and control your rifle without the addition of a larger foregrip, making the weapon profile much smaller. The kit serves as a lightweight, low-profile rail mounted index point for improved weapon control, or as a forward stop to prevent the shooter's hand from reaching the hot front sight assembly or muzzle. The panels are textured, giving the user the ability to really dig into their grip in order to ensure maximum control over their firearm. Overall, a great addition to any weapon for added form and function.